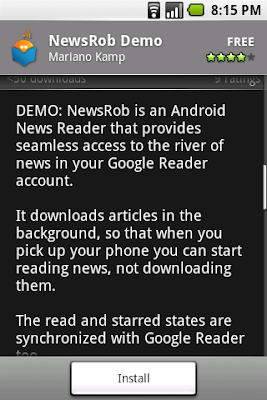 Well, I decided to do a NewsRob demo that is fully functional but restricted to storing 50 articles. Other than that the app is not restricted in any way. I just uploaded it to the market. Unfortunately I don't know how to link directly to the app, or if that is even possible, but when you search for "newsrob" you'll find it. I am very much interested in feedback. You can leave a comment or reach me at newsrob.support at gmail.com. You can also check out the documentation to get a feel of what NewsRob does. There really needs to be some way to mark all read. A lot of times I scan all of the articles and only pick to read the ones that interest me. Having to mark each one as read causes me more work than convenience. This probably the biggest flaw. Second, organization would be nicer than intermingling all the articles together. Many times, I am particularly more interested in news from a particular site. I choose to read the other sites later. I think this app has a lot of potential, but I really do think these two issues would have to be addressed in order for it to catch a lot of interest. Most readers available on the market already do these two things and if you add them to yours, I think yours will be one of the best. Thanks you very much for your feedback. It's very valuable to me. Meanwhile NewsRob 1.2 supports labels, so that should be half of what you need, right? Please don't nail me down to it, but I plan to take your feedback and implement "mark as read" for next Sunday or the Sunday thereafter. How would you like it to work? "Mark All As Read" on a global level or on the label-level? Or both? I guess me real question is: Do you need mark as read on a global level also?